Matt Jarvis need look only as far as the Molineux record books for inspiration as he contemplates a possible career with England. Five and a half decades before the present-day favourite was sent on last Tuesday for his international debut, another Wolves winger was busying himself over the same green pastures. 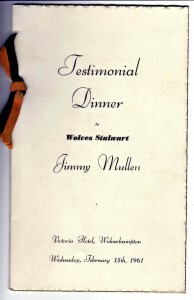 Like Jarvis, Jimmy Mullen hailed from the north-east, an outside-left in the traditional sense who was exiled by football to Wolverhampton in 1937. And he, too, made some headlines from the bench, becoming England’s first used substitute when he went on for Newcastle’s Jackie Milburn against Belgium in Brussels’ Heysel Stadium in 1950 and marking the occasion with a goal. Mullen would win 12 full caps in addition to various Football League X1 and England B honours and repaid Wolves’ faith in him a hundred times over. He had been a childhood supporter of his home-city club, Newcastle, but found Molineux to be his field of dreams. Well, where else could two 16-year-old wingers (he and the right-sided Alan Steen) expect to be thrown into the fray together in a 3-0 victory against Manchester United? Unlike promotion winner Jarvis, there was no gentle breaking-in for him beneath the rigours of the top flight. 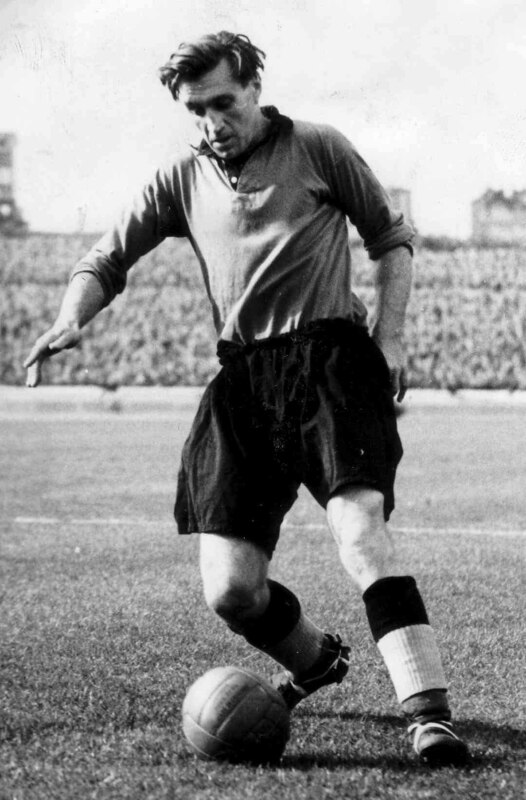 His entire Wolves playing career, all 23 years of it, was spent in the First Division – and he was part of title-winning teams in 1953-54, 1957-58 and 1958-59, as well as a Cup winner. Mullen was still much closer to his 16th birthday than his 17th when he played in the FA Cup semi-final thrashing of Grimsby in March, 1939 – a game that remains, despite all United’s magnificence, responsible for Old Trafford’s highest ever attendance. There was to be no Wembley outing for him that spring, manager Major Frank Buckley opting for Ted Maguire instead in the no 11 shirt for the shock defeat against Portsmouth. But the twin towers were to beckon him more than once after his England debut came in a wartime international against Wales at Molineux in 1942. Five years later, he played for his country at home to Scotland and also appeared in the 1949 FA Cup final victory over Leicester, one of the clubs for whom he had guested during the hostilities. Far from the recent talk surrounding the long post-Bully wait for Wolves to provide a senior England international, Mullen was a star among stars. 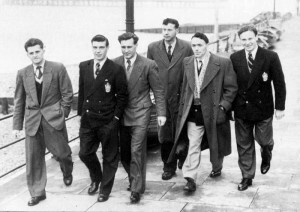 Mullen (two in from the left) on 1954 England duty with Jack Mansell, Johnny Haynes, Ray King, Ted Burgin and Bedford Jezzard. Notwithstanding the fact that only eight men in history have played more Wolves games than he did, he could gaze around the Molineux dressing room and at various times see the likes of Bert Williams, Jesse Pye, Dennis Wilshaw, Peter Broadbent, Ron Flowers, Bill Slater, Eddie Clamp, Norman Deeley, his close pal Billy Wright and his wing partner Johnny Hancocks. Three Lions all! It must have seemed the club were celebrating a call-up every 20 minutes, not every 20 years. 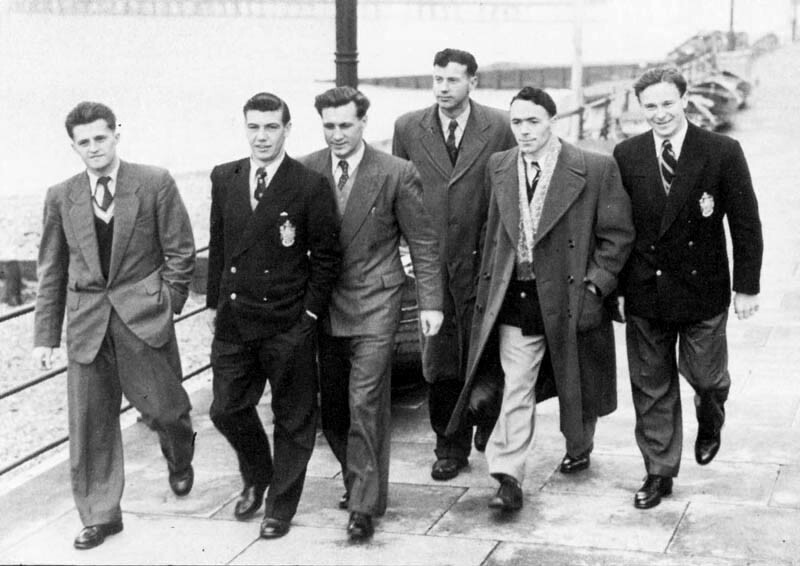 And Mullen sampled international football on the ultimate stage, going to both the 1950 and 1954 World Cups and scoring alongside Wilshaw in the latter in Switzerland. In all, he played 486 League and Cup games for Wolves and scored 112 goals. He was, in every sense of the word, a legend. No-one who was fortunate even to meet him has a bad word but one posthumous honour that went his way can never be repeated. It was in the wake of his sudden death at a dance in October, 1987 – a few days after he had been at Molineux for a Littlewoods Cup tie against Manchester City – that the Wolves Former Players Association was formed. Not that delayed tributes were entirely new to him. 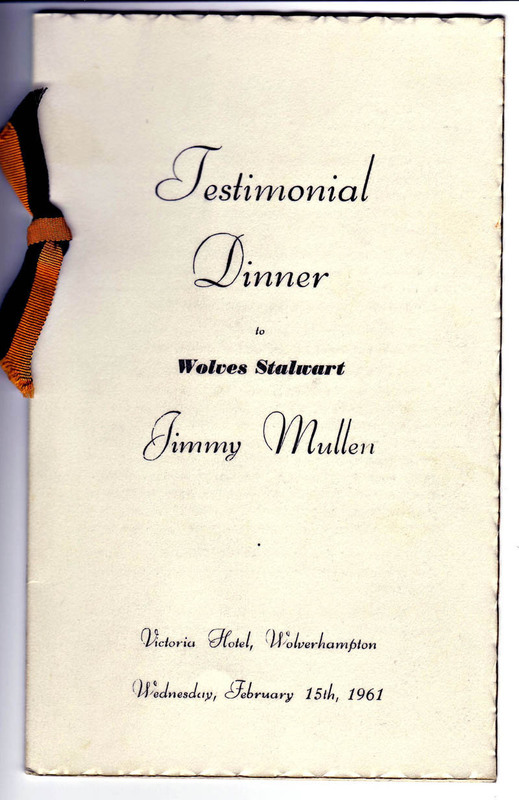 Having played his final first-team game for Wolves in March, 1959 and retired the following year, he was further honoured in 1961 (50 years ago this past winter) with a testimonial dinner in the town. It is a well known fact that he then spent a large chunk of what remained of his working life by running a Wolverhampton sports shop. But Gentleman Jim could hardly have anticipated the little windfall that materialised during the game’s hooligan era. On being refused entry to Molineux because they were wearing ‘bovver boots,’ a group of fans made a bee-line for his premises to buy plimsolls to wear for the day! Posted on: Sunday, April 3rd, 2011.